As a chess player, during a match or tournaments, what comes in handy is a chess score sheet. As is evident from the name, a chess score sheet is used to note down and track the scores of participants, aka the chess players. Synonymous with the rules of the game, the sheet contains several columns like black and white, black won, white won, draw and more. Most sample chess score sheet templates also contain the duration of the game. 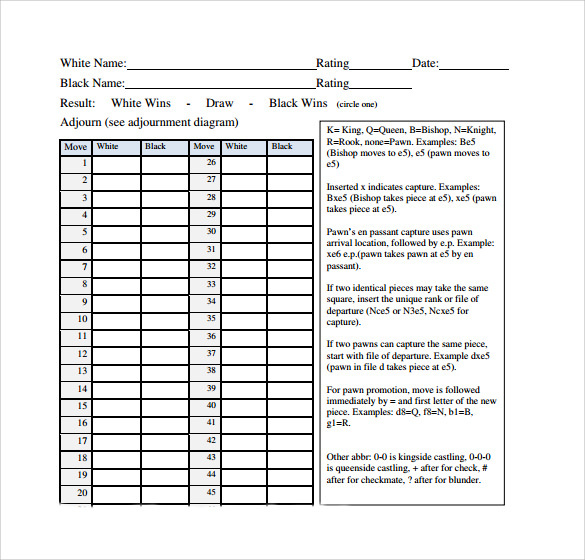 You may like Bunco Score Sheets Templates. 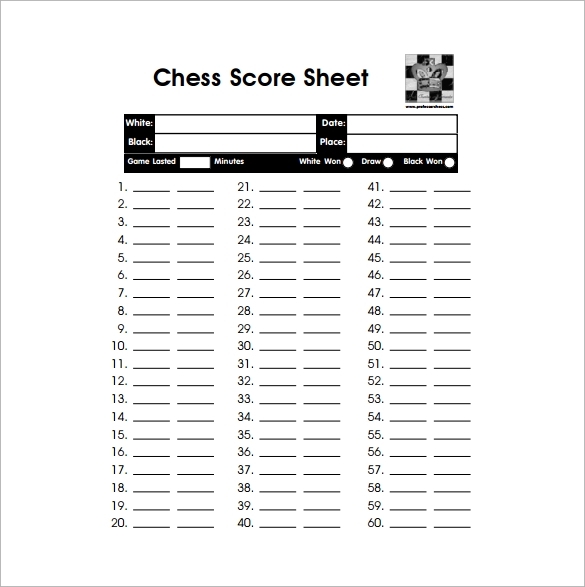 As it can be derived from the name of this template, the printable chess score sheet is one which can be easily downloaded from the internet. 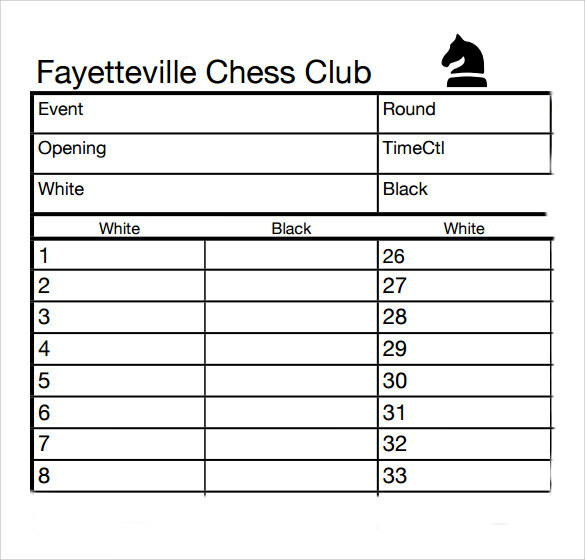 It is a basic chess score sheet template or sample that contains important information like the name of the event, the date of the event, rating, result, board, round and the time. 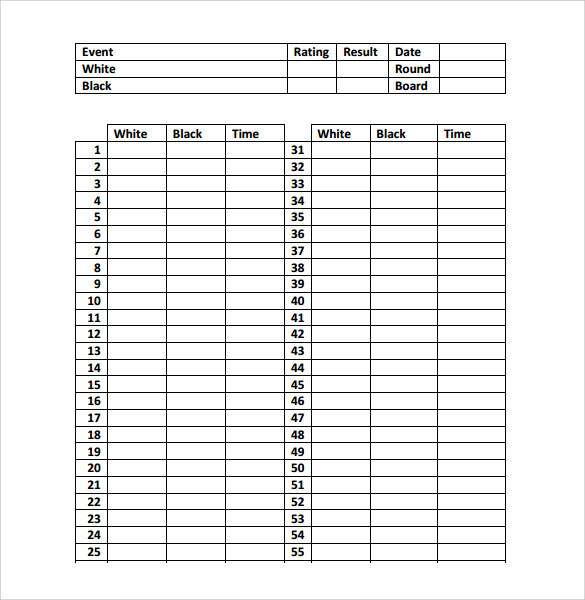 This sample chess score sheet template also has fifty rows and three columns – white, black, and time. An electric chess score sheet is a fairly recent development in the world of chess score sheets and is used by players who want ease of storing and later retrieving important data about the games. 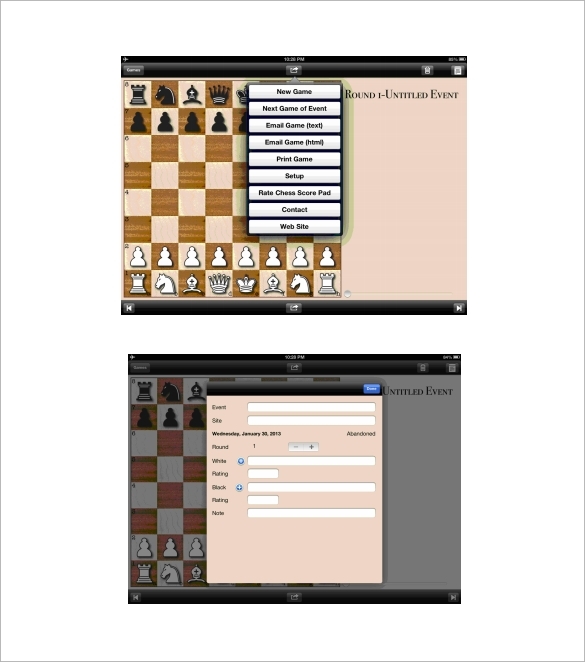 These electronic chess score sheets can be used on your iPhone, iPad, or iPod Touch. To record the details and scores of a game all you have to do is email the PGN file to your desktop and then import the file to your chess database, to be analyzed. 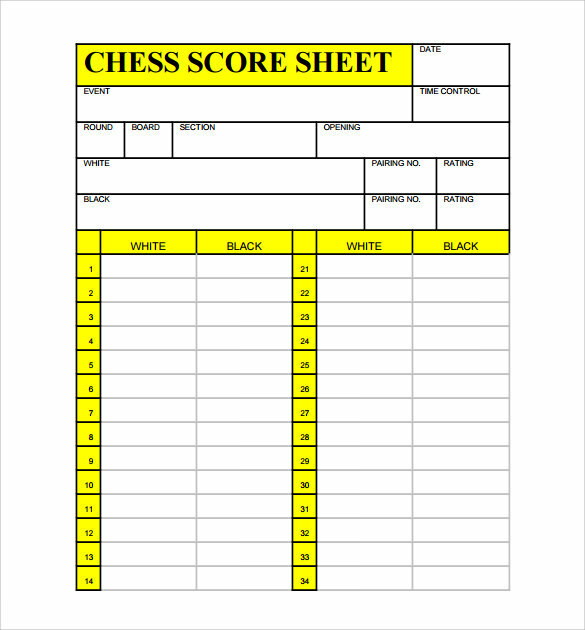 An official chess score sheet can be a template that is easy to use and follow and prepare. If you are organizing a chess match or may be matches, you can easily download such an official chess score sheet which is readily available on the internet in MS Word, MS Excel, or PDF formats. Who Uses Chess Score Sheets? Typically a chess score sheet is used by a chess player or someone who is in charge of arranging chess match or even tournament. These chess score sheets can be formulated based on the many templates or samples that are available online and help in ease of maintaining and recording data not only pertaining to the scores but also the time and location of the match. The benefits of using a chess score sheet are many since they are instrumental in helping a chess match or chess tournament organizer to collect data. That data can be the scores of the players, the name of the event, the location of the event and even the duration of the game. These score sheets come in handy when a chess player or a chess aficionado has to collate or otherwise store historical data or even chess trivia. You may also like Tennis Score Sheet Templates. How to Create a Chess Score Sheet? 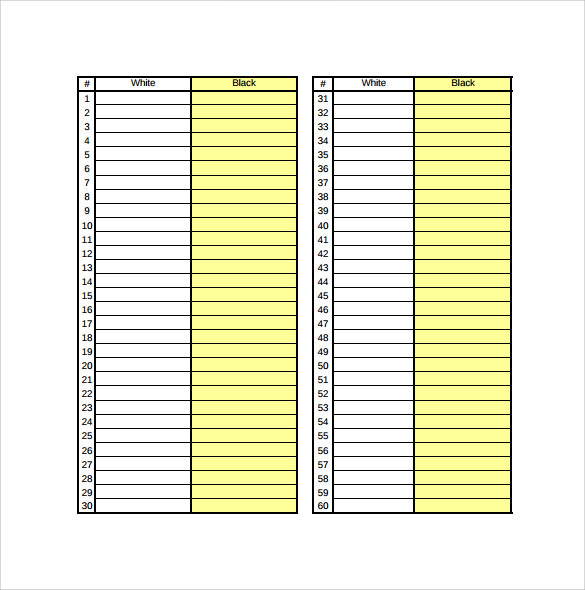 The requirement of a sample chess score sheet template is essentially need based and you can either scout the World Wide Web to get your hands on a sample chess score sheet and even customize it to suit the needs of a particular match or tournament. These chess score sheets are available in MS Word, MS Excel, and PDF formats thus making it easier to download them or reproduce them in the preferred format. You can also see Wrestling Score Sheet Templates. A sample chess score sheet template is the most convenient method of storing data and information with regard to chess matches and tournaments. It can also contain other information like players’ statistics. 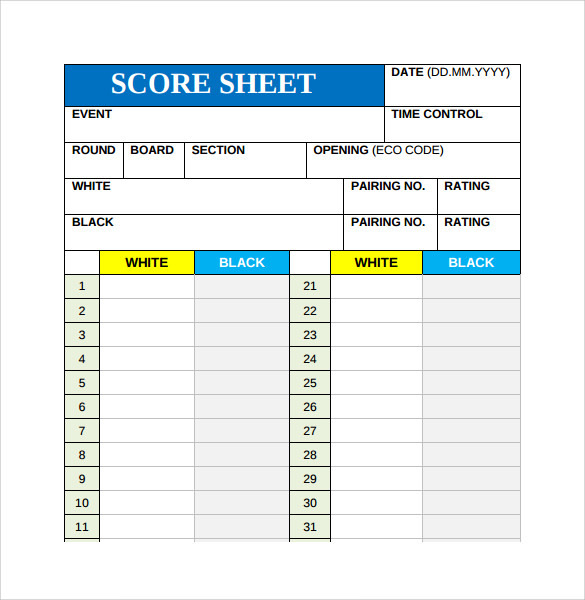 Some sheets have the provision of containing information such as rating and opening and they are also helpful in case you want to keep track of the exact score of each and every player.